Dr Marilyn McCord Adams has died. Ubiquitous presence in medieval philosophy since the 1980s, she specialized in the philosophy of religion, philosophical theology and medieval philosophy. 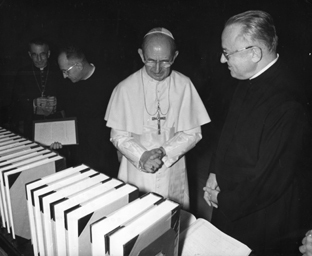 Otto Herman Pesch, the preeminent Catholic ecumenist of the 1960's and 1970's, and a sincere proponent of the teaching of Thomas Aquinas on grace and justification, has died in Munich. Sr. Mary T. Clark, RSCJ (Oct. 23, 1913—Sept. 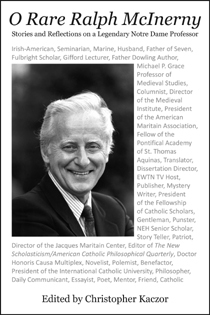 1, 2014) was the author of many books, longtime philosophy professor at Manhattanville College, the editor of An Aquinas Reader, and the Aquinas Medalist for the American Catholic Philosophical Association in 1988. Here is a memorial notice. Manhattanville College maintains the Mary T. Clark Chair of Christian Philosophy in her honor. Unbelievable news from Italy. Riccardo Quinto has passed away. Last night, I learned of the passing of Roberto Busa – a man that many consider the founder of Digital Humanities. In recent years, people have called that lofty title into question, and not without justice. It seems that Busa was one among the many who were striving to bring computer technology – then in its early infancy – to bear on humanistic problems back in the forties. Like most DH scholars today, he was part of a much wider intellectual network. But when I was starting out in the field, it was taken more-or-less for granted that Busa had started it all, and it’s not difficult to understand why. He was a Jesuit – a member of that most troublesome of religious orders, universally renowned both for its learning and for its many provocations both theological and disciplinary. His project recalled the ancient roots of the European university itself: a massive concordance to the works of Thomas Aquinas, who was himself a scholar and an intellectual revolutionary. It’s undoubtedly the case that many at the time were thinking of ways to use computers to conduct research in the humanities, but the scale and sweep of Busa’s project stands alone. It’s a story about old becoming new, and yet about continuity with the past. “In no way!” My wish was to become a missionary to take care of the poor. The subject of Busa’s research – and the occasion for creating the Index – was detailed study of the notion of “presence” in Thomas. Perhaps the New Criticism was taking hold in some other part of the world, but for Busa, philology was the proper hermeneutical framework. [A]ll functional or grammatical words (which in my mind are not “empty” at all but philosophically rich) manifest the deepest logic of being which generates the basic structures of human discourse. It is this basic logic that allows the transfer from what the words mean today to what they meant to the writer. According to the scholarly practices, I first searched through tables and subject indexes for the word praesens and praesentia. […] My next step was to write out by hand 10,000 3” X 5” cards, each containing a sentence with the word in or a word connected with in. Grand games of solitaire followed. It was clear to me, however, that to process texts containing more than ten million words, I had to look for some kind of machinery. (If you’re not ready to do the first ten million by hand, you’re simply not in the good Father’s philological league). I knew, the day I was to meet Thomas J. Watson, Sr., that he had on his desk a report which said that IBM machines could never do what I wanted. I had seen in the waiting room a small poster imprinted with the words, “the difficult we do right away; the impossible takes a little longer,” (IBM always loved slogans). I took it with me into Mr. Watson’s office. Sitting in front of him and sensing the tremendous power of his mind, I was inspired to say: “It is not right to say ‘no’ before you have tried.” I took out the poster and showed him his own slogan. 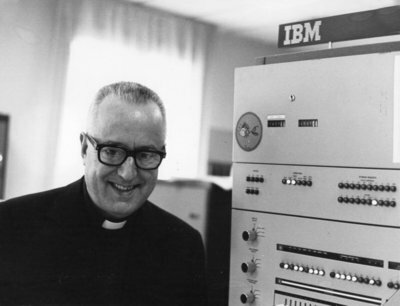 He agreed that IBM would cooperate with my project until it was completed “provided that you do not change IBM into International Busa Machines.” I had already informed him that, because my superiors had given me time, encouragement, their blessings and much holy water, but unfortunately no money, I could recompense IBM in any way except financially. That was providential! I feel like a tight-rope walker who has reached the other end. It seems to me like Providence. Since man is a child of God and the technology is a child of man, I think that God regards technology the way a grandfather regards his grandchild. And for me personally, it is satisfying to realize that I have taken seriously my service to linguistic research. Those words, written thirty years ago, are of a man who intends to live long and well. With great sadness I relay the passing of Fr. Kurt J. Pritzl, OP, Dean of the School of Philosophy at The Catholic University of America. The university announcement can be found here, along with a collection of photographs here and a link of publications here. I’ll post additional notices as they become available. A specialist in ancient Greek philosophy, Fr. 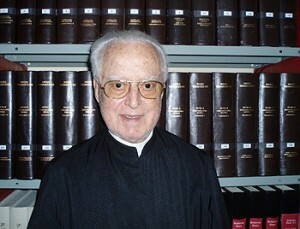 Pritzl received a Ph.D. from the University of Toronto and wrote a dissertation on Aristotle’s De anima under the direction of Fr. Joseph Owens, C.Ss.R. Among his publications were several that explored the Aristotelian notion of truth, the last of which appeared in a collection he edited: Truth. Studies of a Robust Presence (The Catholic University of America Press, 2010). Those of us who were privileged to know him as priest and scholar give thanks for his life in service to the Truth. Update: Here is a notice from the Dominican Province of St. Joseph. It includes a video of a homily by Fr. Pritzl offered on the Feast of St. Thomas Aquinas in 2010 in the crypt church of the Basilica of the National Shrine of the Immaculate Conception. Update: There are obituary notices in the Milwaukee Journal Sentinal and The Washington Post with reader comments. Update: CUA has put online a video of the Mass of Christian Burial here. From the website of Edward Feser comes the news that philosopher, James F. Ross, has died (here, and here). Thomists will know of him for many reasons, one of which would surely be his work on analogy. Ross’s website has links to things that he has written, some of which are available online. Francis Beckwith recounts a story that is perfectly Ralph.